If you didn’t see Bernie when it was in theaters, it’s definitely worth adding to your Netflix queue. Jack Black normally plays Jack Black, but in this movie he plays a cheerful, well liked, Gospel singing, undertaker in the small town East Texas town of Carthage that murders the mean and unpopular old millionaire widow of the town’s banker (played by Shirley MacLaine). He was so popular and she was so disliked, that the District Attorney (played by Matthew McConaughey), afraid that the State wouldn’t be able to get a fair trial, did the unthinkable and had the trial moved. It’s movie is based on a true story and was inspired by a 1998 Texas Monthly article that was written by one of the film’s writers, Skip Hollandsworth. It was co-written and directed by Austin’s own Richard Linklater, who also wrote and directed School of Rock. It’s a great film and a Jack Black is amazing. The writing really captures life in Texas, they get all the details right. The film uses actual townspeople from Carthage and one of the funniest parts of the movie is when one of the town’s citizens explains how “Texas is really 5 states”. 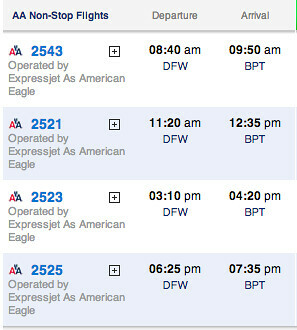 It’s kind of stretch to say that this clip is pertinent to this new Double AAdvantage Miles promo from American, but the description of Texas is so funny (and true in way) that the offer gave me a slim excuse to share! Offer: Beginning February 14, when you fly nonstop between Dallas/Fort Worth and Beaumont, Texas, you can earn double AAdvantage miles. Learn more about the special introductory fare available for travel booked by February 21. 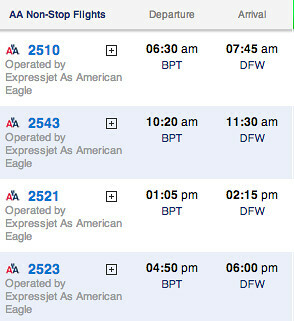 American is offering four flights each way. Registration is required before you travel using promo code BPT2X. Go here for complete details. Does the 500 elite minimum come into play? ie 1000 miles RT from DFW. I also wonder if flying from SPS or ACT would have the entire trip doubled or not.